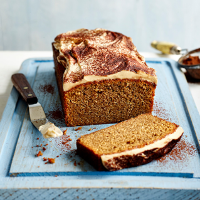 Cappuccino loaf cake Coffee and walnut cake is an all-time favourite in the WF office, and this is our modern spin on it: a fine-textured, coffee-infused loaf topped with the silkiest whipped mascarpone frosting. 1. Preheat the oven to 170˚C, gas mark 3. Grease a 900g (2lb) loaf tin and line with baking parchment. Heat the cream and coffee in a microwave (or small pan) until warm, stir to dissolve the coffee and cool. In a separate bowl, mix 1 tsp of the coffee cream with the mascarpone for the frosting and chill until needed. 2. In a large bowl, using electric beaters, cream the butter with the two sugars for 3-4 minutes, until pale and fl uffy. Beat in the eggs one at a time, followed by the vanilla and the remaining coffee cream. 3. Fold in the flour and salt until you have a smooth batter. Scrape into the tin; bake for 45-50 minutes, until a skewer inserted into the centre comes out clean. Transfer to a wire rack; cool to room temperature. 4. Meanwhile, make the frosting. Sift the icing sugar over the chilled coffee mascarpone and whisk with electric beaters for 1-2 minutes, until silky; chill again until needed. Spread the frosting over the cooled cake and dust lightly with cocoa powder just before serving.